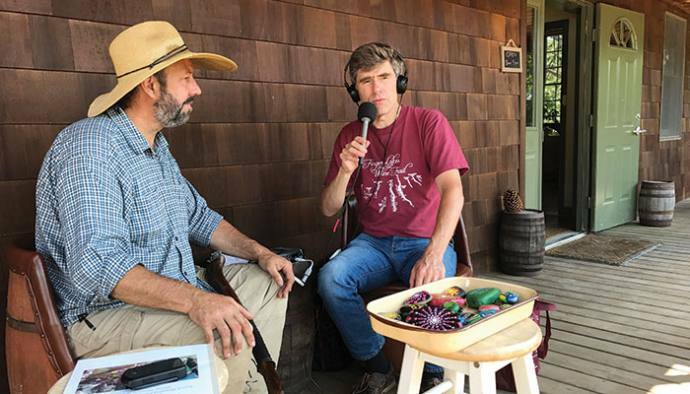 His velvety rich voice fills the airwaves every weekend, offering an unparalleled knowledge of all things food, wine, and gardening in the Finger Lakes. Michael Warren Thomas is the voice of the Finger Lakes. He broadcasts live from restaurants, wineries, and garden stores, and features interesting guests often. His Saturday and Sunday morning radio shows on WYSL 1040-AM – “Naturally Green,” “The Grapevine,” “Discover the Finger Lakes,” and others – are required listening for folks who like to keep up with the region’s wine and restaurant scene. The 53-year-old hails from Rome, New York, and went to the University of Rochester to study economics. After graduating in 1986 he took a job at the Center for Governmental Research, but after a couple of years, he decided to follow his love of alternative landscape design. Thomas also fell in love with Rochester’s 19th Ward where he still lives today. He is married with two daughters, ages 16 and 20. He served as horticulturalist for the City of Rochester for five years, but his weekend radio work – which he started in 1994 – has become his fulltime job. Thomas is his shows’ host, producer and remote location technician. He even does the advertising sales and promotion. Yes, he has visited all 11 Finger Lakes and about 100 wineries, many more than once. No, he doesn’t have a favorite winery, nor a favorite wine, red or white. 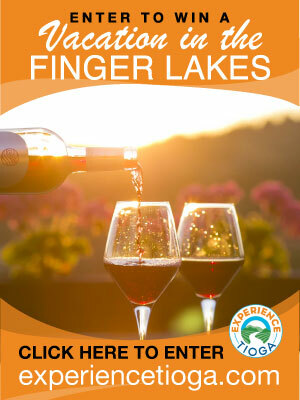 In fact, he raves about the quality of all Finger Lakes wines in general, and dry rosé, Riesling, dessert wines and now even some reds, specifically. He says many wineries are now making “90-point wines” – wines of distinction rated by leading industry publications. They have fared well when they’re up against wines from all over the world in events like the San Francisco International Wine Competition. On one of his recent shows, Thomas shared an article from a major wine magazine. 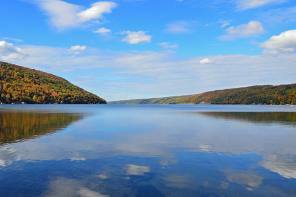 It rated the Finger Lakes high on a list of places to visit. He often takes written praise like that to restaurant owners to convince them to add more Finger Lakes wines to their wine lists. One of Thomas’s pet peeves is that the wine lists of New York State restaurants either don’t include any Finger Lakes wines, or they offer a very limited selection. In fact, he devises spreadsheets that list just about every restaurant in Rochester, Syracuse and Albany according to the number of Finger Lakes wines they offer. Scott Osborn, president and co-owner of Fox Run Vineyards on Seneca Lake, has supported Thomas’ radio show since they began in 1994. “I was very impressed that he recognized what was happening with our industry so early on,” says Osborn. “He was the only local media person at the time who understood what we were doing from a quality standpoint. He also saw the problems we were having getting our wines into local restaurants. The segment breaks on the show feature an eclectic mix of music – the kind you rarely hear on radio anymore. Thomas has been on the air for 23 years. “Doc and Katy Abraham hosted their gardening show on WHAM 1180 radio for 52 years. I’m shooting to beat that; I’m almost halfway there. By that time I’ll be in my 80s and the thought keeps me humble.